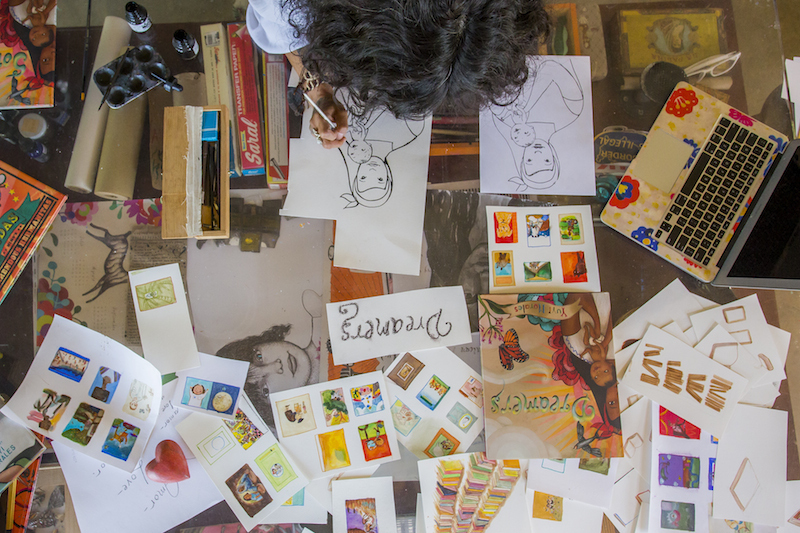 Welcome to our new column The Bookshelf, where we take you inside the creative studios of some of our favorite children’s book authors and illustrators. 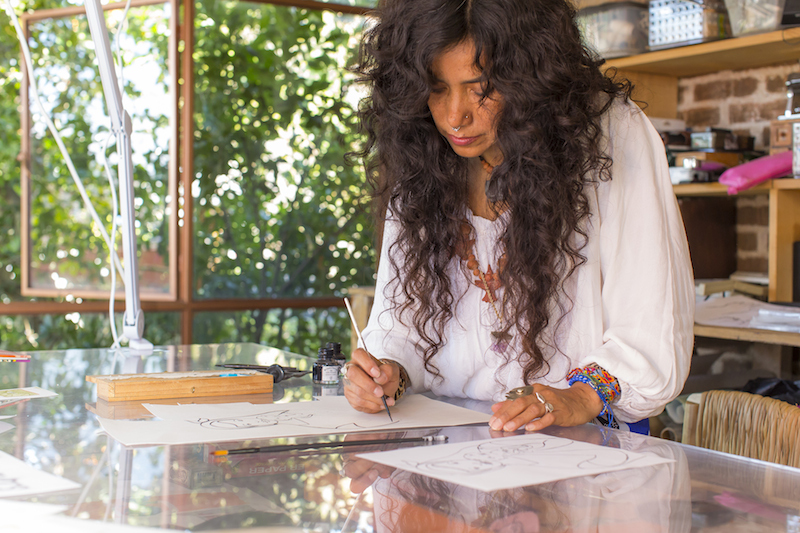 We’re kicking off the series with a tour of the magical Mexican art studio of author-illustrator Yuyi Morales (it’s basically perched on a volcano!). 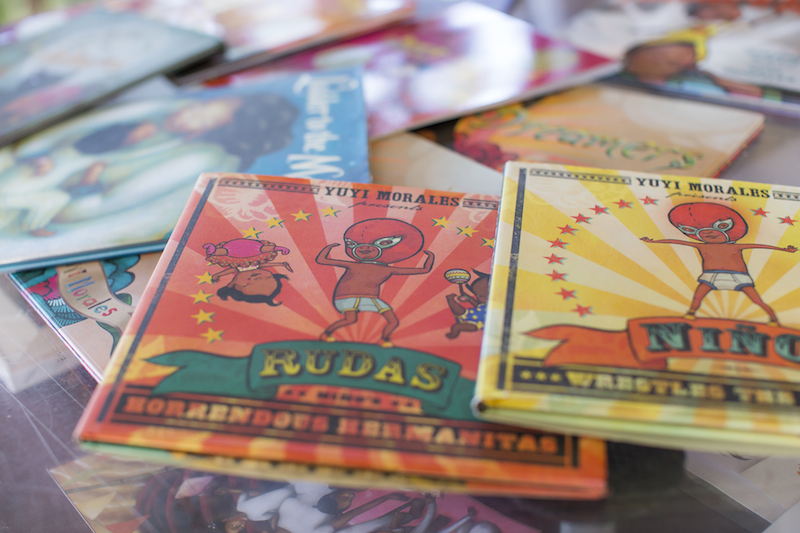 Yuyi has published 15 children’s books over the course of her career—including the beloved Niño Wrestles the World and Just a Minute: A Trickster Tale and Counting Book—and earned countless awards. 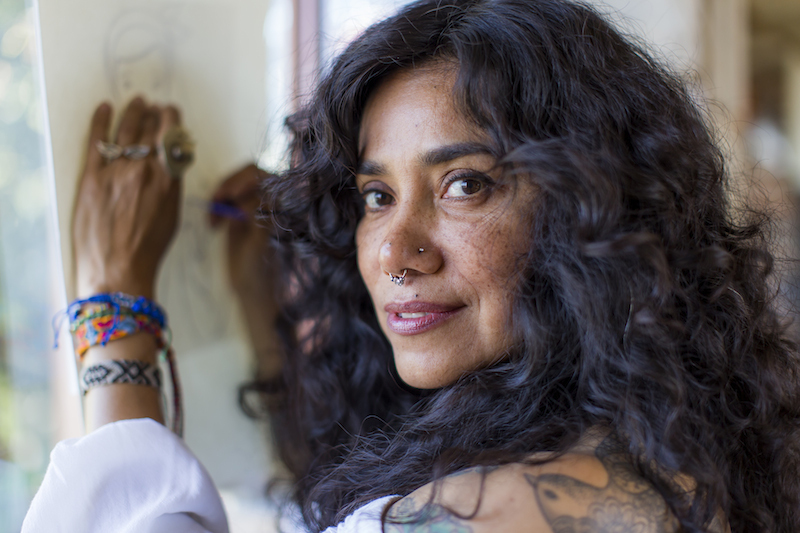 Her latest book is Dreamers, a colorfully illustrated memoir in which she recounts her own immigration journey from Mexico to the San Francisco Bay Area 25 years ago. 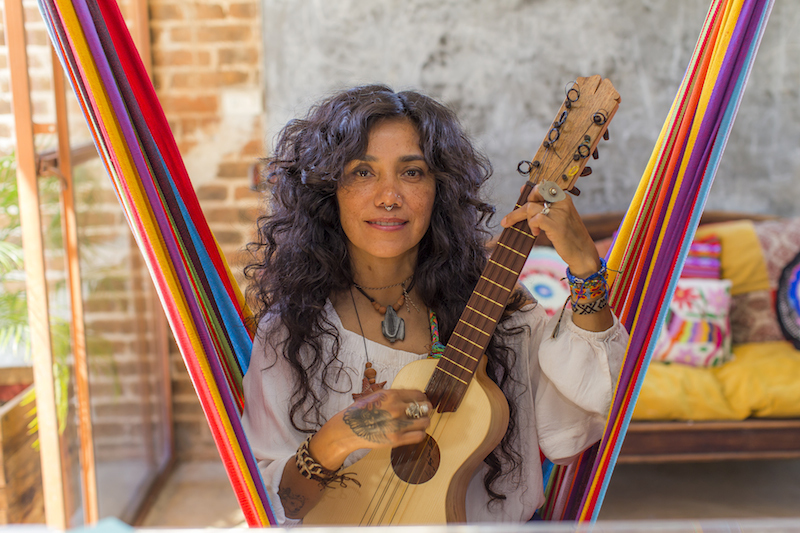 Speaking almost no English and traveling with her infant son, Morales found respite and connection inside local public libraries, specifically among the colorful titles in the children’s book section. 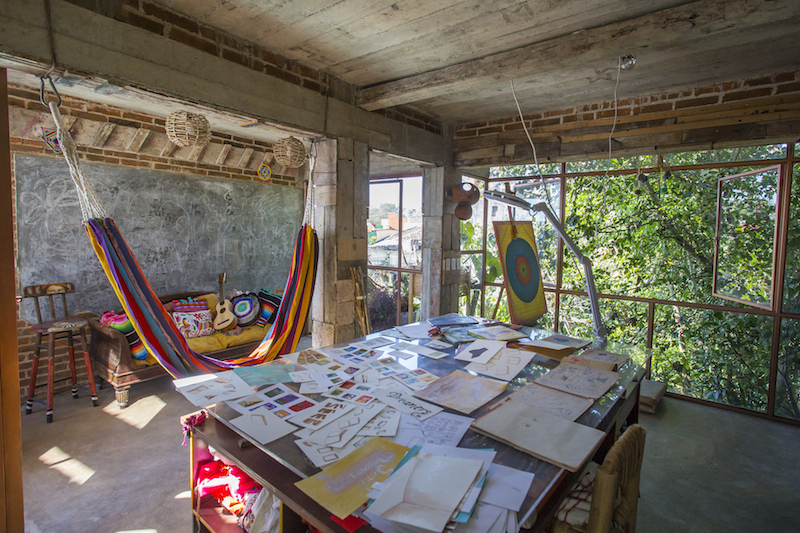 After more than two decades in the Bay Area, Yuyi has relocated back to her home town of Xalapa, Mexico, and works from a glass-walled studio carved into volcanic rock and surrounded by jungle canopy. 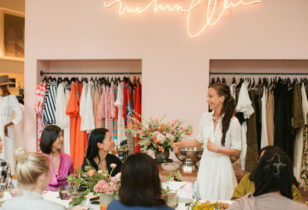 She takes us inside to talk motherhood, immigration, and inspiration. "It’s located in my house here in Xalapa, where I was born. It’s an old house I’ve remodeled. I get to it by walking past the main house, through the garden, and up the stairs made of volcanic rock. 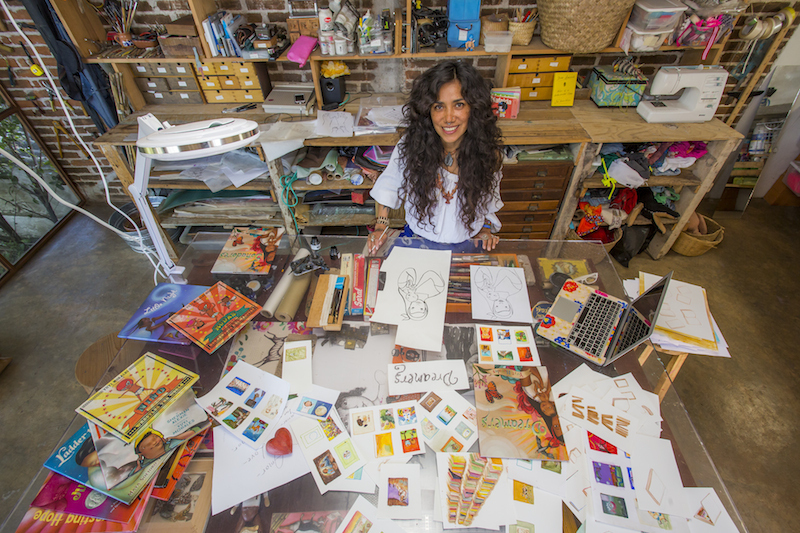 My studio is a place I built where I can make any mess I want." 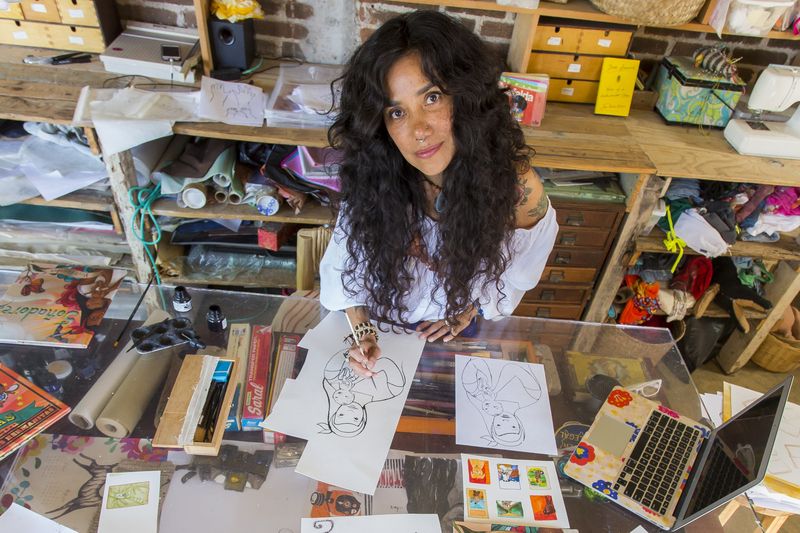 "I actually have two working spaces: a big yellow desk in the living room, which is home to my computer, printer, and scanner, and where I make some of my illustrations happen. 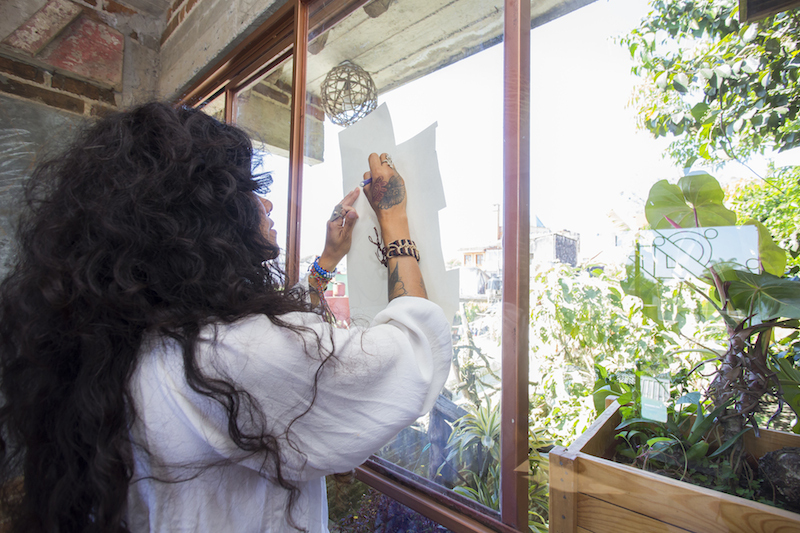 The back of my house is the studio space, where everything that is messy happens. My worktable, which was built by my ex-husband while we lived in California, is made from a sign and covered in a sea glass surface. That allows me to have two surfaces; I can put reference images underneath, and on top is where I paint and draw. I have tables that might be used for cutting and sewing, plus an area with a sink and a concrete bar. I also have a hammock and a couch. 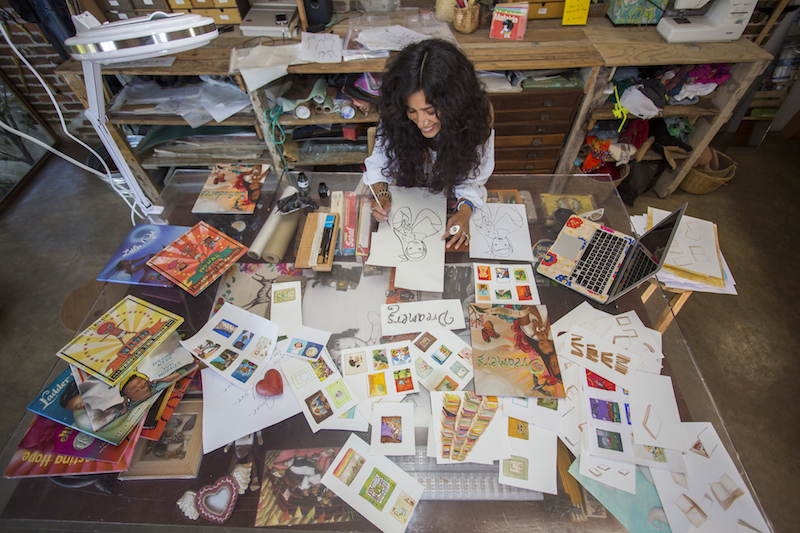 I work in every part of my space!" "Besides my computer, I also use a tablet and stylus. In my studio, I’ve accumulated any tool I might use! Lots of brushes and ink. A whole drawer is devoted to jars of paint, another to my palette. I mostly paint with acrylics, so I use this surface since it stays humid, and there is a drawer especially for that. I have a wall where I hang tools—pliers, hammers, brushes, cutters, everything. My sewing machine is very important to me—I use it a lot for my books. 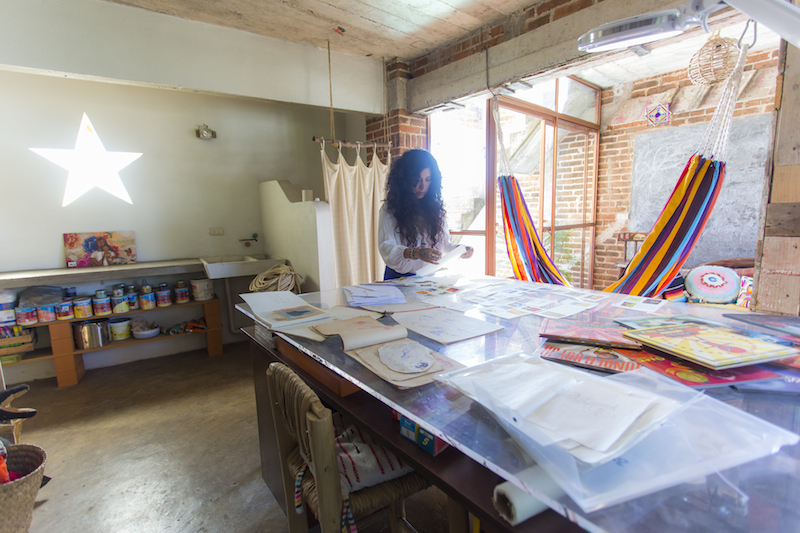 There are also shelves of boxes that include needle, thread, wires, wooden pieces, various fabrics, different types of paper, and items I’ve collected from my daily life or wanderings that I might use for future pieces of art." 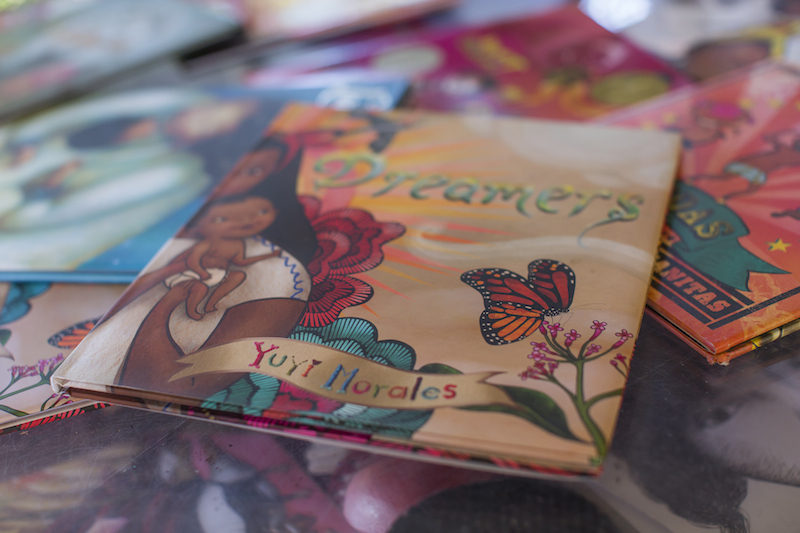 "Dreamers is about my own immigration story and how I found a world of wonder and hope for myself and my son at the public library. While it’s my own story, it is also a story about what it is like to move to a new place, finding yourself alone and confused, and learning that you can make a home in a new country. At first, I didn’t think it was important to share my story, but I then realized that by not believing my story was important, I was also telling other people—especially children—that their stories as immigrants also weren’t important. And that isn’t true. Every story matters." "I am a voice in a discourse that is happening in the United States. I was angry, and tired of hearing powerful people like President Trump assign narratives to what immigrants are, that come from ignorance and hate. For children, I needed to dispel the notion that immigrants come to a country needing charity, when immigrants are a gift in and of themselves. We should be proud and happy to welcome them, and both give and receive the gifts we each have. 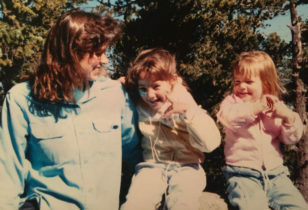 I learned so much as a young mother moving to the United States with my son, and how we found our place. It inspired me to search for my own purpose living here in a new country, and I wanted to put it in a book to celebrate this recognition immigrants should all have: that we come as a valuable people bearing many gifts." "I could write many words, but the truest answer is: telling stories to my son." "My son, Kelly, is 25 now and a musician in New York City. He is a big influence on me and what I do—I adore him. He’s the reason I started creating my own stories and making books—I wanted to pass onto him the stories from my family in Mexico, especially when we first moved here. I wanted him to have that connection with Mexican culture, as the son of a Mexican mother. I read so many books to him, even ones with words I couldn’t pronounce or fully understand. We both loved books and the public library, growing up together as book lovers and storytellers." "I think this is my fifteenth book." 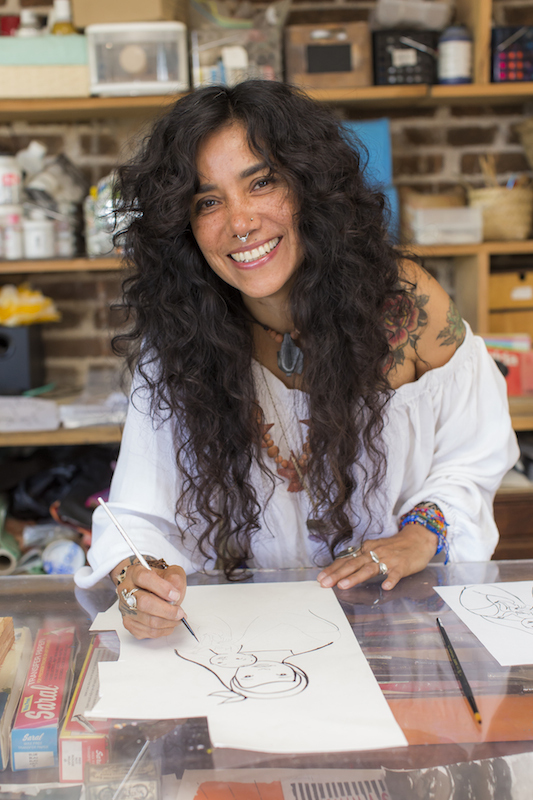 "My first book was actually one for the school market, called Las Buenas Manos, and I was more an illustrator-for-hire and I was following the authors’ instruction. So, for me, my first book was Harvesting Hope: The Story of Cesar Chavez. In 2000, I won a grant from the Society of Children’s Book Writers and Illustrators (SCBWI), and was able to display my portfolio at their summer conference. An editor at Harcourt saw my illustrations there, and she reached out to me to illustrate my first book, Harvesting Hope." 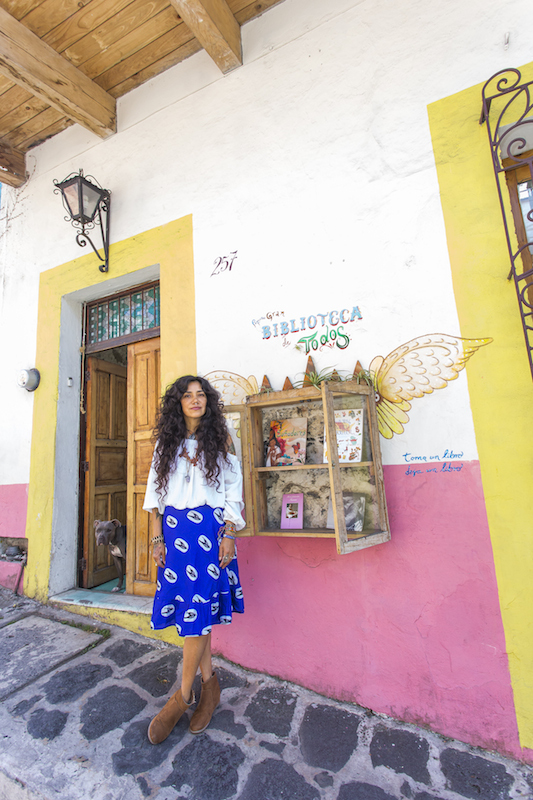 "I was born in Xalapa, Mexico, and lived there until I was 25. I studied physical education and psychology. When I finished my bachelor’s, I wanted to be a swimming coach, since I admired my coach and wanted to connect with kids the way he had with me. I did work as a swimming coach for a few years when I met my son’s father, a Californian living in Mexico. He was learning folk music, and we met and fell in love. When our son Kelly was two months old, we came to the United States—and I didn’t have the language or documentation to continue coaching. When I moved to the United States, I first lived in Walnut Creek with my in-laws while going through the immigration process. Eventually we moved to San Francisco, where I began exploring the public library and began falling in love with children’s books." 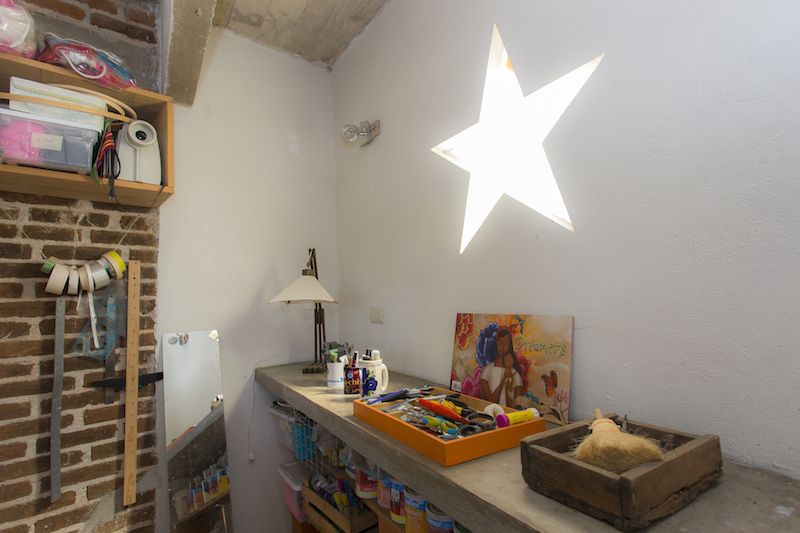 A special place for Yuyi's newest book. 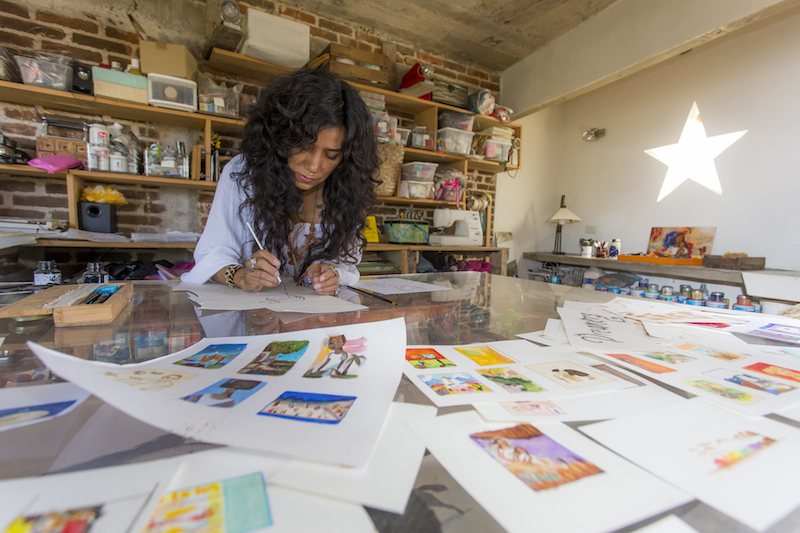 "All I am right now is an artist and a book creator, and I cannot imagine being anything else. 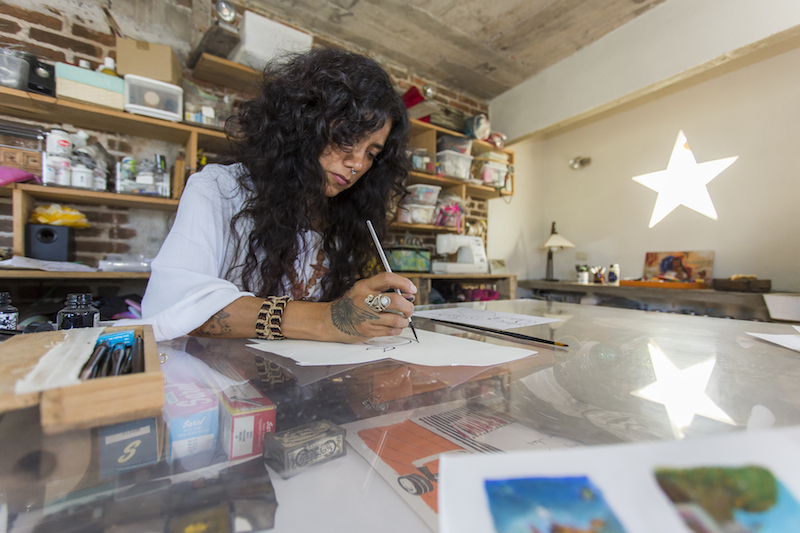 But because I am an artist, I consider everything I do during the day part of my process and my work." "I always imagine that ideas come from a place inside me, where I have a box filled with paper and words, and I take one of them out and see what happens. I’m sure they come from memories, things that make me curious or afraid, thoughts that wake me up early in the morning, and ideas I muse over. For instance, when I just moved to the United States from Mexico, my books were about how it felt to be afraid when I was a kid. 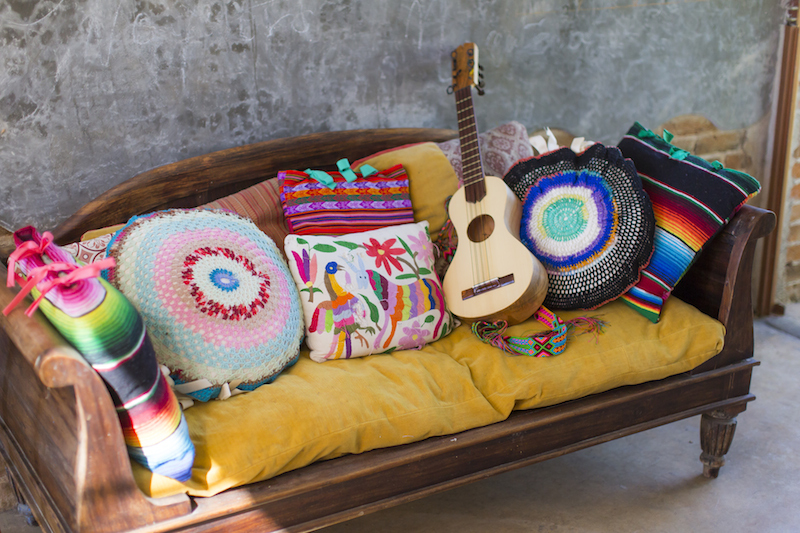 I also feel a deep connection to popular culture in Mexico, but I also want to explore how this connects to my identity as an immigrant. 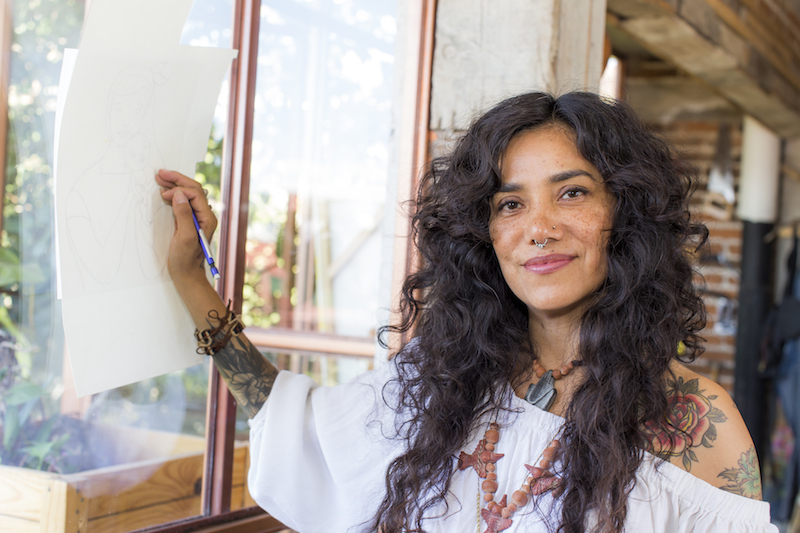 I’ve become this person—a Mexican child turned American citizen—with my heart divided in two places, and my ideas are steered by my life and experiences." "Harvesting Hope is like a gold medal for me. 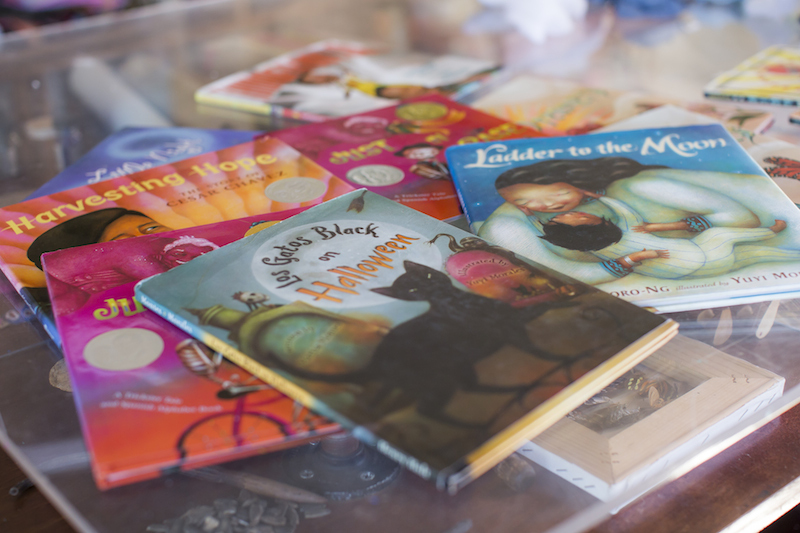 From the beginning, it showed me a path: That children’s books could be powerful and could drive discussion, and that I could make books that mattered to me. The year it came out, I also wrote the first book that I would both write and illustrate, Just a Minute: A Trickster Tale and Counting Book. 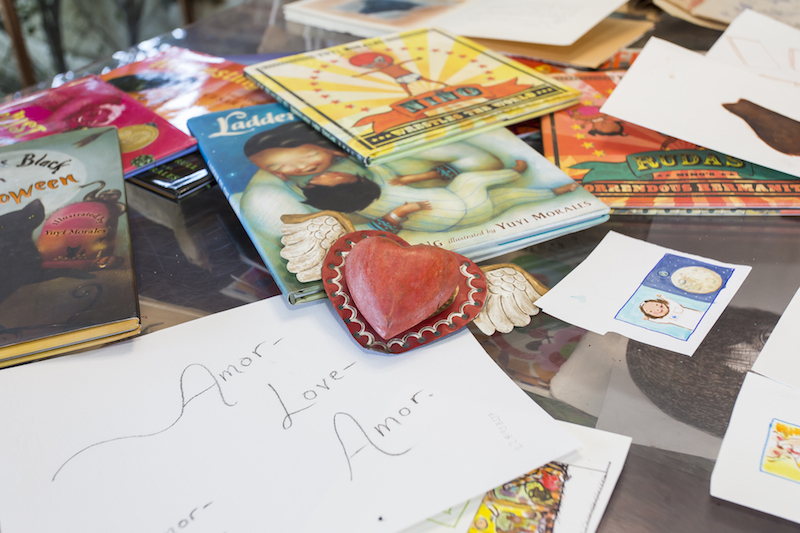 A committee of librarians awarded Just a Minute with the Pura Belpré Award, which recognizes excellence in books portraying a Latinx cultural experience. 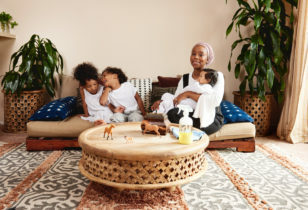 That gave me the confidence to know that what I was making wasn’t just for me or my son, but for a bigger audience too." "I start work by writing in my journal. I make little drawings on tiny thumbnails, the smallest I can possibly make, so I can see how the book will look, how tall. Then I make a storyboard out of these thumbnails, eventually turning into lines, no detail work. I do refine after I’ve thoroughly revised my first drawings, and then by my editors. I don’t start sketches until much later, when I decide how that book will be painted or brought to life. 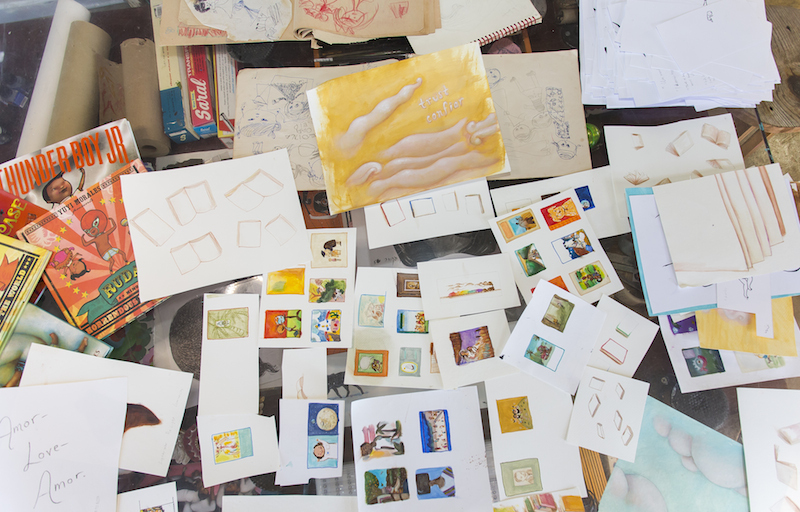 There is a lot of work between the thumbnail and how I’ve chosen to depict things, because it might be painting, photographs, puppets, or something else." "I have a schedule. But it does depend on the book—like when I was making Dreamers, I didn’t go anywhere or do anything else except work all day. I would start at 8:30 a.m., after breakfast, I would bring food back to my desk and continue working until 2:30 a.m. at night. But on normal days, I work from my office in the mornings, work from my studio in the afternoons, and fit in a dance class. I try to do a dance class every day—and right now I’m learning to play a folk instrument called a jarana in a music class. 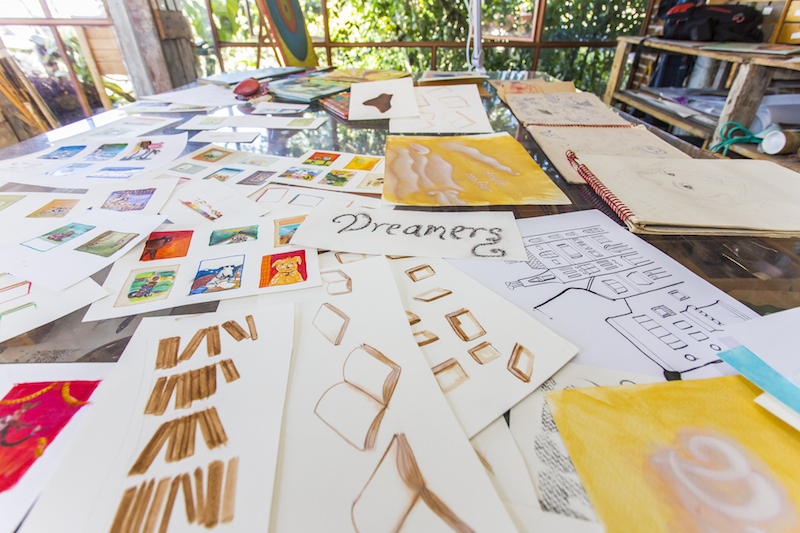 That’s part of my work, too, and where a lot of living inspiration happens." 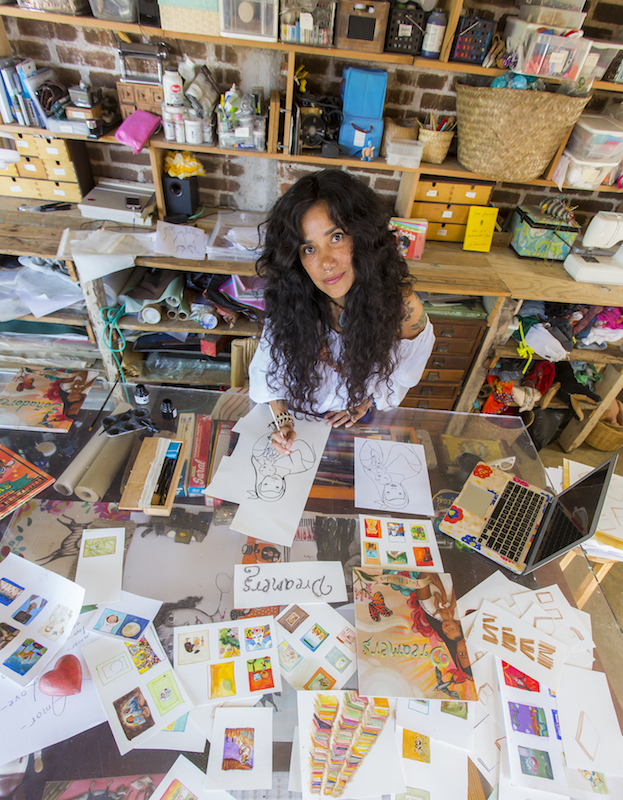 "I’m based in Xalapa, Veracruz, Mexico, and I’m back here after living in the United States for 20 years. I’m learning to reconcile my identity as Yuyi who lives in Xalapa now, versus when I left it. It’s a fantastic place. But unfortunately it’s one of the most violent places in the world, where there is a lot of crime and poverty. Sadly, it is also historically one of the places where journalists are assassinated. It isn’t always an easy place to live, but it’s beautiful. Families are always working to make a better world for their children, and it’s so exquisitely lush—we’re close to the mountains, so everything grows here. Plants grow inside houses sometimes, in the walls! And mushrooms, insects, and other wildlife. My home has a small but abundant garden, and I’m in downtown Xalapa, the capital of Veracruz. And yet it’s still a small town, and filled with artists and young students because of the university. There’s also an art school, film, painting, music, all kinds of art happen!" Making the most of all that natural light. 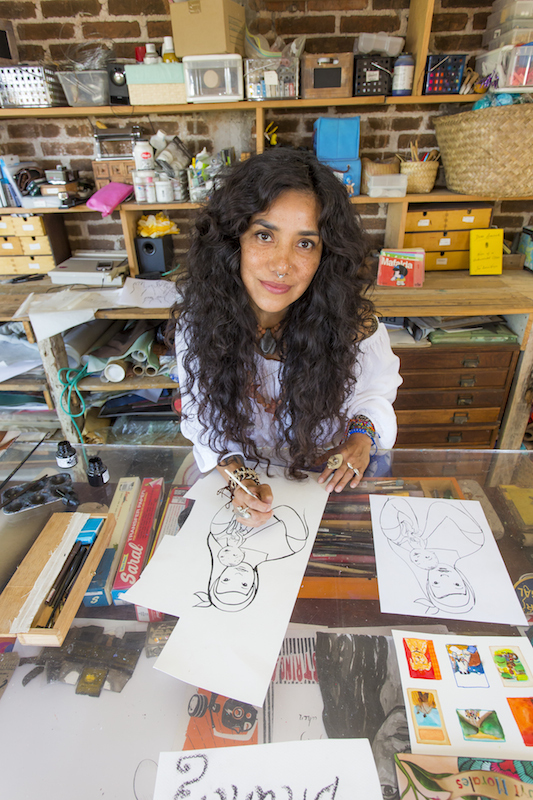 "I visit art stores when I go to the United States, but I also go to the hardware store a lot. I buy everything from glue to sandpaper. 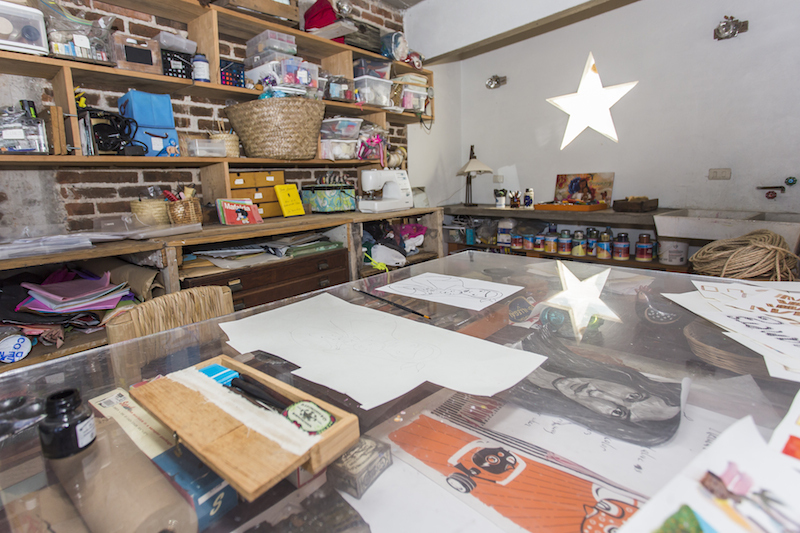 In Mexico, there are places called papelerías which sells stationery but also office supplies. And of course I use the entire world: My supplies include images, colors, surfaces, plants, sticks I found in the street or in my garden, random stuff from my house. For me, the whole world is an art supply store!" "When my son was little, he loved books I didn’t necessarily like. I understand that children attach themselves to things they need, and sometimes it’s as simple as repetition, or a way for them to make sense of the world around them. For some adults, I guess a book might not fill that need, since they don’t need the same tools the children do. I also think there are children’s books that adults adore; what I see is adults connecting more with children’s books, because we are never too old to make use of such tools. Children’s books—especially picture books—can emotionally move us, because they often tap into something universal: a sense of how we are so connected. The best children’s books stretch out their arms to us. Adults also have a need for connection and the knowledge that stories have meaning." "I read, study, and try to learn what children need at each stage of their development, particularly emotional and intellectual development. I will find the best books I can on these subjects, but I also trust my intuition here—my brain and my hands—and I always follow the excitement and joy that comes with adding a certain word, color, or shape. I might not be able to explain it, but as long as I follow that intuition, it will work out!" "I try to tap into things that are very joyful in me. 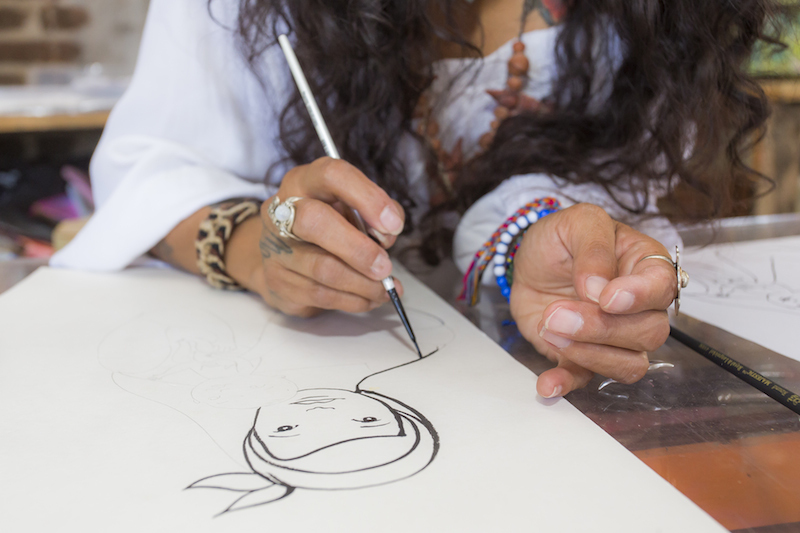 As an artist and professional person, I’m very aware of my emotions; not just joy, but fear and even anger—I’m always going to a place deeper than just the surface. Emotions have a lot to do with how we grow up, and I have children in mind when I’m creating books. I always think about my son, and the many children I meet when I visit schools and libraries. When I’m creating, I might not know exactly what I’m doing yet, but I know I’m doing it for them." 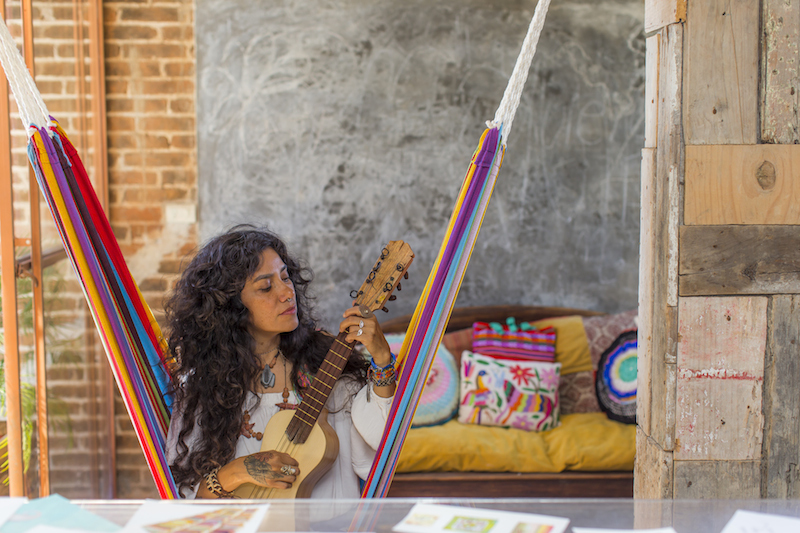 "I live on a street in a very old neighborhood here in Xalapa—from pre-Columbian, indigenous times—it’s one of five original neighborhoods. Now it’s full of families and the elderly. I love being in my house. You can find me walking at the organic market each Saturday, which is filled with people who care about health and food and taking care of our earth. You might also find me at Café Lago (the Café by the Lake), which is just a few blocks from me. I go there at night to have a vegetarian burrito and a chai frappe with friends. You might also find me at a vegetarian restaurant called Fenogreco where I eat at almost every day. I’m also at Quilombo, the Brazilian cultural center, where I take dance classes and dance to live drumming—the energy of the kids is so contagious! 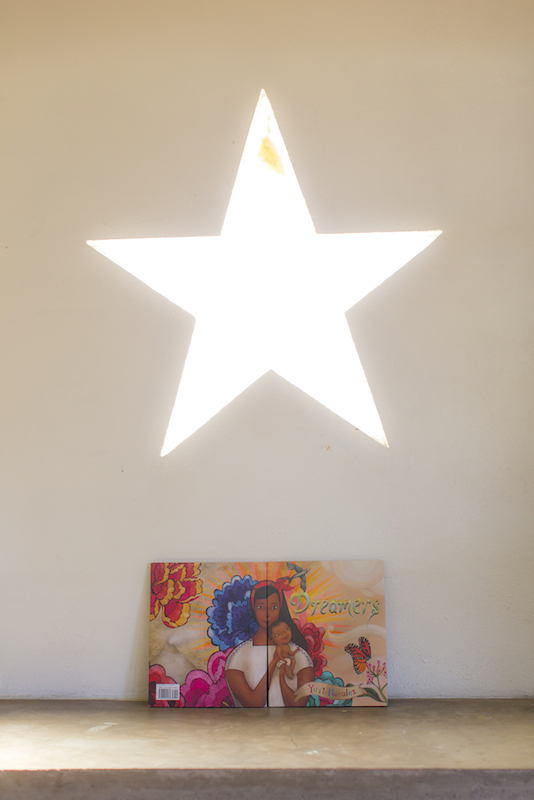 Lately, I can be found at an old building that houses musicians who are working to restore, teach, and enrich the culture of Veracruz, called Nobody’s House. 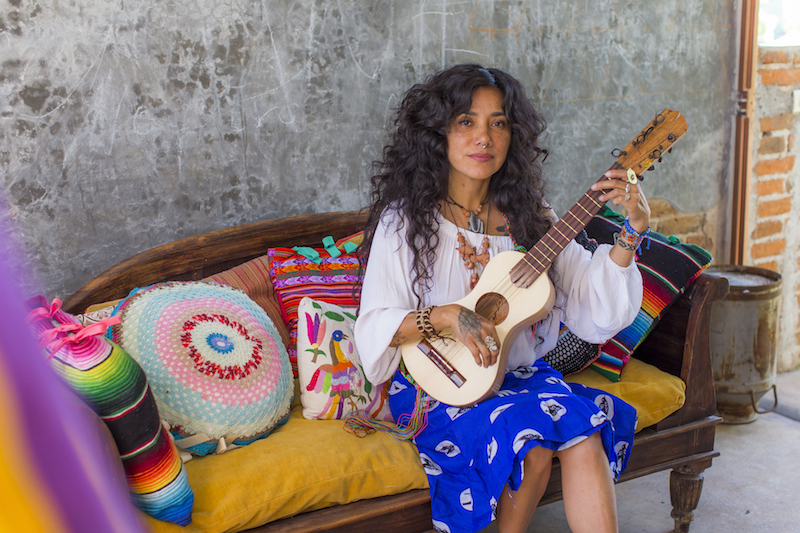 The music, son jarocho, is a combination of indigenous music, Spanish music, and African music from the enslaved people that lived in this region. 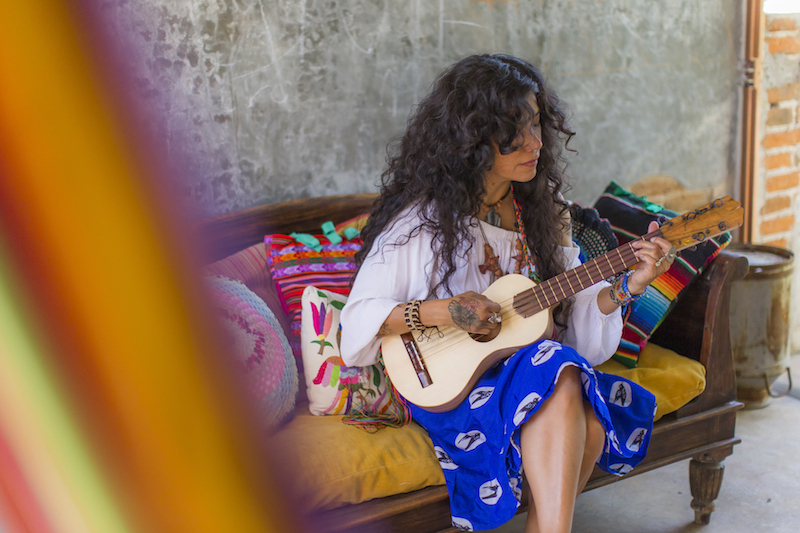 I’m learning to play the jarana, the guitar you saw in Dreamers. It’s depicted as one of the gifts the mother brings to the United States, because when Kelly and I came to California, we brought our love for music with us." "I believe that if something is valuable to a child, of course it will be valuable to an adult. Adults are the development of what was in their childhoods. I also want them to gain everything! To see themselves as the heroes they are in their own stories, and creators of their own path. I want them to know that they are not alone, that they are beautiful and amazing and powerful. I want them to gain that from reading my books. I want them to realize I celebrate them." 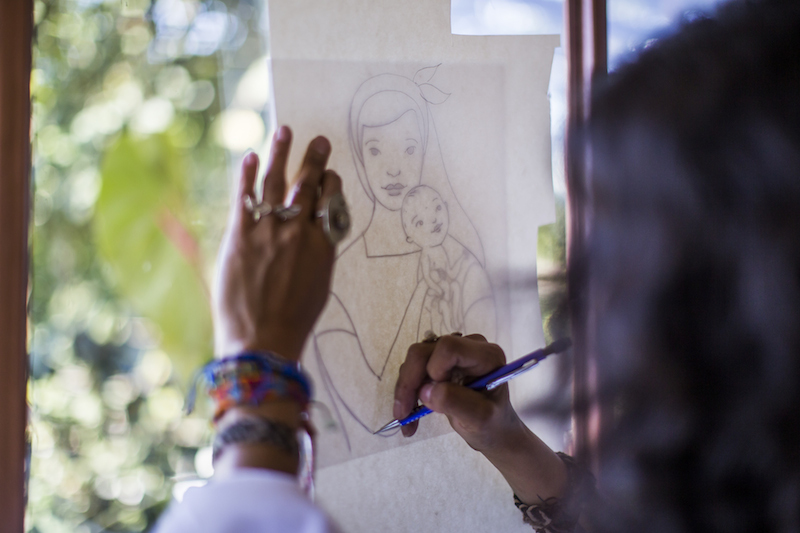 "Growing up in Mexico, I had magazines, comic books, and coloring books, but I did not have children’s books. As an adult, I was inspired by many books I read with my son at the public library. The most influential book for me as an adult is one I read when I was 12 years old: Gabriel Garcia Marquez’s The Incredible and Sad Tale of Innocent Eréndira and her Heartless Grandmother." "Follow your passion: create things that excite you, that you can’t wait to make, paint, write, and combine words with lines and colors. Stay and keep working even when you want to give up, love and be brave, and do the thing that gives you joy. And stay connected—know that people want to know and see what you are doing. I love telling children, because they are illustrators of the future, to draw to write whatever they want, however they want. They have their own voice and talents. We are just waiting for them to show us what they can do, and surprise us! I would also tell aspiring author/illustrators to continue growing and working, and to make room for other voices to be heard as well." "It’s not on my worktable yet, but I have it in my heart. I will be writing about tough topics like immigration, what it’s like to not feel welcome, family separation, and healing." For more of Yuyi's adventures (plus her newest tattoo and cute dog), follow her on Instagram.